A new vessel built by Heesen Yachts in the Netherlands is the world’s first fast-displacement motoryacht equipped with hybrid propulsion. 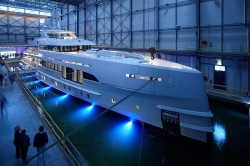 M/Y Home can use two sources of power for propulsion: diesel-mechanical and diesel-electrical. Either source can be used independently or they can be used simultaneously. 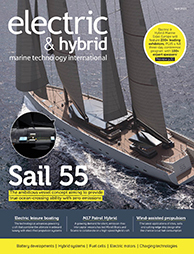 Two water-cooled 127kW DC electric shaft motors enable the yacht to cruise at 9kts using the generators alone. With a range of 3,750nm at a cruising speed of 12kts, M/Y Home’s top speed is 16.3 knots, achieved with two 600kW 12V MTUs. The fast-displacement hull form was devised by Van Oossanen and implemented by Heesen’s in-house naval architects. The ABS-classed M/Y Home is a 50m aluminium motoryacht below the 500GT threshold with an exterior design by Omega Architects. Its draft is 2.15m. Following its launch, the vessel will remain in the harbour in Oss to commence commissioning of its systems. She will then move to Rotterdam where she will undergo sea trials and official tests before delivery to her owners later this month.